Jimsonweed (Datura stramonium), also known as datura, Devil's snare, and thorn apple, is a hallucinogenic plant often used to facilitate vision and spirit quests as part of traditional ceremonies, but it has also been used medicinally to treat asthma symptoms. TJimsonweed is an annual herbaceous plant with white or violet flowers and grows up to 6.5 feet in height. 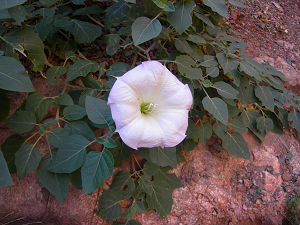 "Datura on North Kaibab Trail, Grand Canyon" by Alan English CPA is licensed under CC BY-NC. 1944 Navaho Witchcraft. In Papers of the Peabody Museum of Archaeology and Ethnology. 2010 Aspects of Datura Poisoning and Treatment. Clinical Toxicology 8, no. 2: 104-110.